Valentine's Day quotes and Valentine sayings for kids can be used in a variety of ways to help kids celebrate this popular holiday. 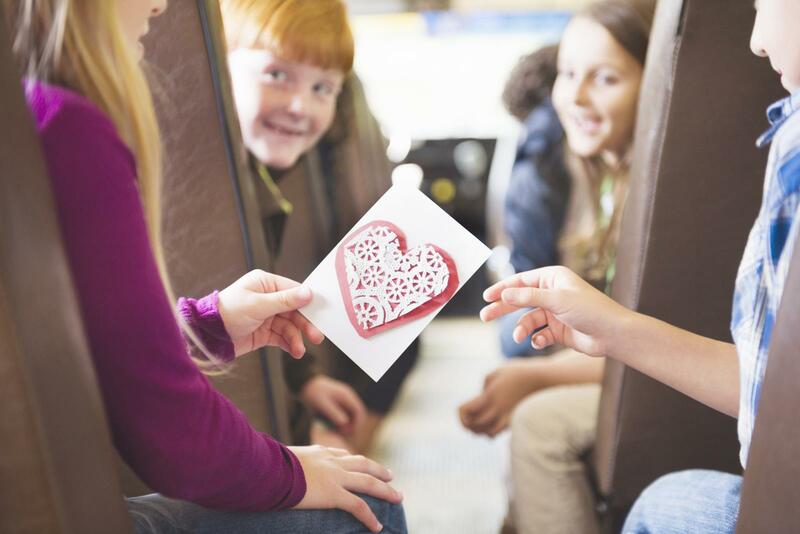 Writing cards for classmates, or giving cards to family members and friends is a great way for kids to get into the Valentine's Day spirit. Happy Valentine's Day to my best friend in the whole world. Hope you like the treats! Favorite person, favorite sweets! Have the best Valentine's Day! Glad I get to celebrate with my best friend today! You make me smile all the time! Have an amazing Valentine's! Knock, Knock! It's Valentine's o'clock! You're my favorite person and you rock! I'm so happy I get to celebrate Valentine's Day at school! Enjoy these treats, you're really cool! Have the best Valentine's Day! You're the best in every way! I hope you have the best day today! Enjoy the goodies! Happy Valentine's Day! Happy Valentine's! A friend like you is hard to find! You're the sweetest Aunt and I hope you have a great Valentine's Day! Happy Valentine's to my favorite cousin! Enjoy the cookies- I've made a dozen! Thanks for being the best! Happy Valentine's Day to my favorite Grandparents! Happy Valentine's Day to my mom and dad! You're the best parents, you're really rad! Happy Valentine's Day- enjoy some candy! I hope your day is fine and dandy! On this day, have a chocolate bar or two, or three. I'm so happy you're my mommy! To show you I love you with all my heart, enjoy these scrumptious sweet tarts! Valentine's Day quotes can be used to personalize cards and gifts from kids to their family and friends. Quotes or Valentine's Day sayings for kids can be original or borrowed. In what ways can kids use these quotes? One of the most popular ways to incorporate quotes with a Valentine theme is on Valentine's cards. Help kids make up their own silly quotes by having them write down what Valentine's Day means to them and then having them transfer their written quotes onto cards. Print cards using a word processing program on the computer, or supply construction paper or card stock, along with markers, glue, and any other embellishments you have on hand. Once they have cut and designed their cards, they can write their own personalized quotes inside. Photo album-Give the gift of pictures to a favorite relative. Let kids print out some of their favorite photos and create a photo album out of card stock. Punch holes in one end and tie a ribbon to hold the pages together. Have kids write an original quote underneath each picture, or print out a caption on the computer to add to each photo page. Personalized flowerpot-Purchase small terra-cotta pots and let kids decorate the pots with markers and paints. Have kids write their original quotes around the rim of the pot and spray an acrylic sealant on after they have finished writing on and decorating the pot completely. Banners-Let kids write out their favorite quotes on large pieces of butcher block paper cut to banner size or print out a banner on the computer complete with quotes in large letters. Children can decorate the banners with drawings as well. Quotes are often centered around a theme, and kids' Valentine's Day quotes and Valentine's sayings for kids are no exception. Very young children typically use easy quotes that express their simple thoughts of love and devotion, mainly to their parents, although they may also write sayings to their siblings, grandparents, and other family members. As children grow and mature, however, their focus turns to their peers, and so the quotes they choose may be more friendship-centered as well. Boys and girls who now have crushes on significant others may choose the humorous route as a means of expressing their affection. These quotes may be self-penned or copied from an inspiring Website. Either way, Valentine quotes for kids will help children relate their thoughts and feelings about this special day. Encourage kids to look at many quotes before creating their own to use in a variety of ways to celebrate this popular holiday. Using Valentine quotes, kids can develop their creative skills, as well as their verbal, written, and spelling skills. Of course, Valentine's Day quotes are also simply lots of fun!